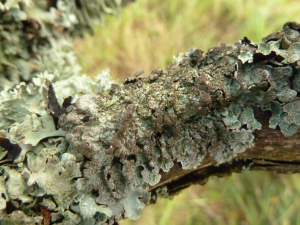 On the boundary between woodland and farmland, growing on an oak twig, a green-grey foliose lichen with a rather netlike pattern on the lobes as well as what looks like brownish soredia. The underside of the lobes is black with tiny rhizines. Also present, but not noticed until looking at the photo are possibly a few very small apothecia. I am not sure if this is Parmelia saxatilis or Parmelia sulcata but as it is not unlike the former that I found growing on a wall I am guessing at this.